We take a look at the best winches on the market today as well as the pros and cons of each. There is a wide range of reasons why you may need to purchase a winch, whether it’s for off-roading or simply having one handy to pull large objects. The process of choosing the right winch isn’t easy, however, as some offer several different options. Along with determining which winches fit your vehicle without extensive modifications, you’ll want to choose a product that offers the capacity you need. This is normally determined by its pull rating, measured in pounds. You will also need to choose what type of rope or cable you prefer. The two typical choices are wire and synthetic and we’ll explain the differences on those further below. Another aspect to consider when shopping for the right winch is whether you’ll come in contact with lots of water. If so, you’ll want a winch that offers water sealing so you can take the winch through water crossings without worrying about damaging it. We're going to look at the best winches on the market today as well as the pros and cons of each. For more information on winches, refer to our table of contents. 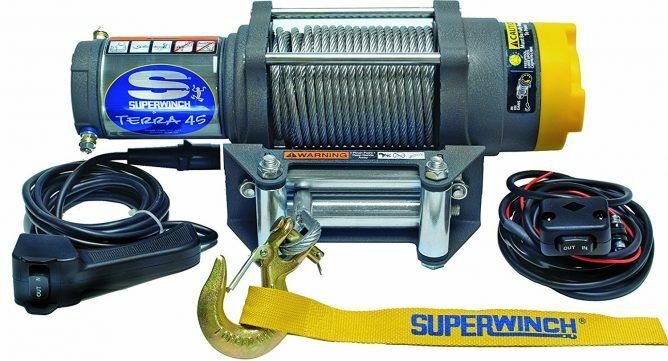 Available in a variety of different models, the Superwinch Terra lineup is one of the most popular and highly rated family of winches available on Amazon. There are a total of six variants to choose from: Terra 25, Terra 25SR, Terra 35, Terra 35SR, Terra 45, and Terra 45SR. The “SR” version for each model uses a synthetic rope instead of a cable. Differentiating each model is the type of motor and steel wire or synthetic rope it uses. The Terra 25 and Terra 25SR both feature a high efficiency, low-amp draw sealed 1.3-horsepower permanent magnet motor, while the Terra 35, 35SR, 45, and 45SR variants have a 1.6-hp permanent magnet motor. The 25 and 25SR use either a 50-foot 3/6-inch steel wire or synthetic rope, while the 35 and 35SR come equipped with a 50-foot 13/64-inch steel wire or synthetic rope. The range-topping 45 and 45SR models offer 55 feet of ¼-inch steel wire or synthetic rope. The model number for each of the Superwinch Terra winches actually indicate the pull rating. The 25 and 25SR have a 2,500-pound pull rating, while the 35 and 35SR have a 3,500-lb pull rating. As you can guess, the 45 and 45SR are capable of pulling up to 4,500 lbs. Every winch that’s part of this lineup uses an all-steel planetary gear that utilizes machined-in, oil pocket bronze bearings for smooth, uncompromised movement. Additional features on every model include an ergonomic cam action freespooling clutch that allows users to quickly disengage the motor and manually draw out as much winch rope as necessary, a handlebar-mounted switch, a four-way roller fairlead, a heavy duty latched hook with thimble, and a limited lifetime warranty. This lineup of winches has the most number of positive reviews out of all the winches on Amazon, with owners saying the Terra winches are powerful, quiet, fast, operate smoothly, and are easy to use. There are a small number of complaints that the included hardware, such as the nuts and bolts, is poor quality, along with some complaints about the instruction manual, making it a bit difficult to mount and install the winch. 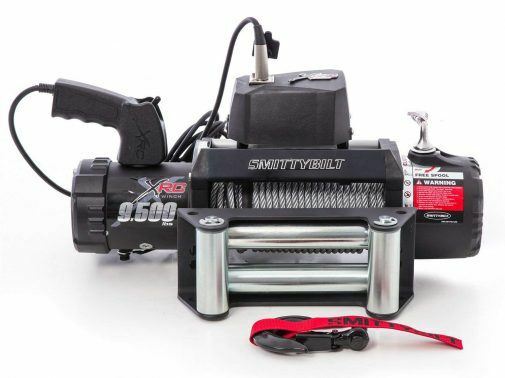 Powered by a 6.6-hp amphibious motor and a 3-stage planetary gear system, the Smittybilt XRC winch offers a 9,500-lb load capacity and is completely IP67 waterproof with a state-of-the-art 500-AMP solenoid. This winch has a corded remote and comes complete with all wiring necessary for installation. It uses a sliding ring gear clutch and an automatic in-drum brake, while a 93.5-foot, 5/16-inch diameter wire rope provides plenty of reach for all sorts of situations. The winch itself features a textured black finish and measures 20.88-inches long, 6.3-inches wide, and 7.4-inches tall, while tipping the scales at 78 lbs. Smittybilt includes a limited mechanical lifetime warranty with the XRC winch and a 3-year electrical warranty. One of the most reviewed winches on Amazon, this product has an overwhelming number of positive reviews. Owners are extremely happy with its performance and build quality, adding that it’s very easy to install and use. Some users did complain that there are plastic pieces that are prone to breaking on this winch. There are a number of complaints of failure after minor use, so it’s possible there are some quality control issues. Another lineup of winches that offers several variants comes from WARN with its Vantage family. Six variants are available: Vantage 2000, 2000-S, 3000, 3000-S, 4000, and 4000-S. The “S” versions of each model uses a synthetic rope and an aluminum hawse fairlead, while the standard variant comes equipped with a wire rope and roller fairlead. The 2000 and 2000-S models are powered by a 0.9-hp permanent magnet, sealed motor with a differential planetary gear train sporting a 155:1 gear ratio. Those models also have a dynamic gear brake and have a 2,000-lb rated line pull. The wire rope version with a roller fairlead weighs 13.25 lbs, while the synthetic rope variant with an aluminum hawse fairlead tips the scale at 12.25 lbs. Moving onto the 3000 and 3000-S models, these winches use a 1.1-hp permanent magnet, sealed motor with a 3-stage planetary gear with a 180:1 gear ratio. The 3000 and 3000-S variants can pull up to 3,000 lbs and use a spring brake. The wire or synthetic rope on these models measure 50 feet by 3/6 inch. The 3000 model weighs 16.95 lbs, while the 3000-S is 14.95 lbs. At the top of the model range are the 4000 and 4000-S versions, both powered by a 1.4-hp permanent magnet, sealed motor. These winches offer a rated line pull of 4,000 lbs as indicated by their model number. They also feature a 3-stage planetary geartrain like the 3000 and 3000-S models, with a 180:1 gear ratio. WARN outfits the 4000 and 4000-S models with either a 50-foot by 7/32-inch wire rope or 50-foot by 7/32-inch synthetic rope. The 4000 weighs 17.5 lbs, while the 4000-S is 15.45 lbs. Every winch in the WARN Vantage lineup sport a grey powdercoat finish and an intermittent duty cycle. The 2000 and 3000 models and their variants include a mini-rocker switch that can be mounted to handlebars, while the 4000 and 4000-S get a dash-mounted control switch. Both the 3000 and 4000 models and their variants also include a corded remote. 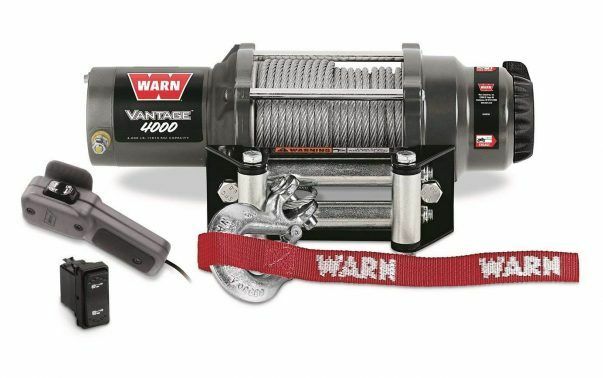 WARN offers a 5-year mechanical and 1-year electrical warranty on the Vantage winches. Many owners stand by the WARN brand name, especially the company’s customer service. Since these winches are offered in a variety of pull ratings, it’s likely the Vantage lineup has something that suits your needs. The vast majority of owners find their winch to be powerful, fast, and quiet. There are a small number of complaints of the cable snapping or getting frayed after use. Some owners also added that the included instructions are poorly written, making the winch a bit difficult to install. If you don’t feel like comparing multiple variants of a product, take a look at the Champion Winch Kit. This winch uses a 1.3-hp permanent magnet motor and offers a 3,000-lb max rated line pull and includes a mounting channel, a roller fairlead, and a remote control. This winch uses a 46-foot by 3/16-inch galvanized, super-duty aircraft cable that the company says is less prone to fraying, even when it’s being used in highly abrasive terrain, such as rocks, mud, or sand. The cable is guided onto the 1.5- by 3.2-inch drum through the roller fairlead, helping maximize the life of the cable. Sporting a 3-stage planetary gear system, this winch also features a free-spooling clutch and a handlebar-mounted remote control for easy control while winching. Dynamic braking of the winch drum offers the stopping power necessary for the job. The 3-stage planetary gear has a reduction ratio of 171:1, giving the winch a line speed of 4.3 feet per minute with a full load, or 8.9 feet per minute with no load. This winch includes a clevis hook, hook strap, mounting channel, roller fairlead, and remote control. Champion offers a 2-year limited warranty and free lifetime technical support with this product. 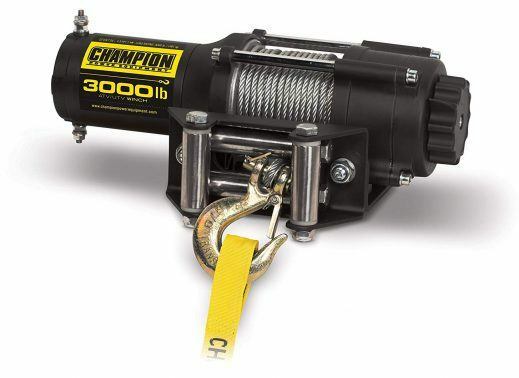 With an overwhelming number of positive reviews, owners of this Champion winch praise how easy it is to use and how powerful it is. Owners are mixed when it comes to operation noise, with some saying the winch is fairly quiet, while others say it’s noisier than competitors’ winches. One common complaint is that the included remote is bulky. 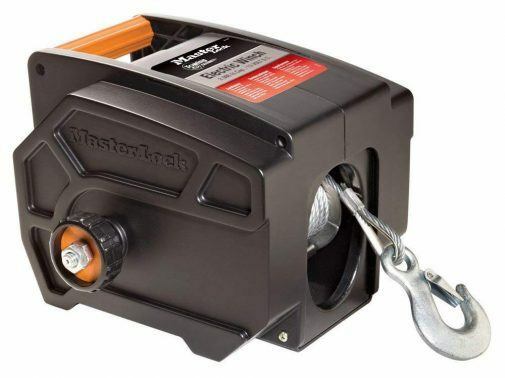 If you’re looking for a portable electric winch, Master Lock offers a 12-volt DC winch with 2,000-lb pulling capacity. This winch includes a galvanized steel cable with a safety hook, steel mounting plate, 20-foot power cable, remote control, and a hand crank. This winch can be used with cars, trailers, trucks, and even boats, and comes with a convenient built-in carrying cable. Along with the 2,000-lb pulling capacity, it has a 6,000-lb rolling capacity and 5,000-lb marine capacity with a maximum boat size of 18 feet. Compared to most mounted winches, you’re trading a bit of capacity for portability. Owners are overall satisfied with the performance of the winch, especially given its price and that it’s not a mounted unit. But some owners do say it operates very slowly and is noisy, while one major complaint is that it doesn’t offer a reverse feature. Other owners note that the included power cord is a bit short. This winch is ideal for owners looking for a light-duty unit that is portable. 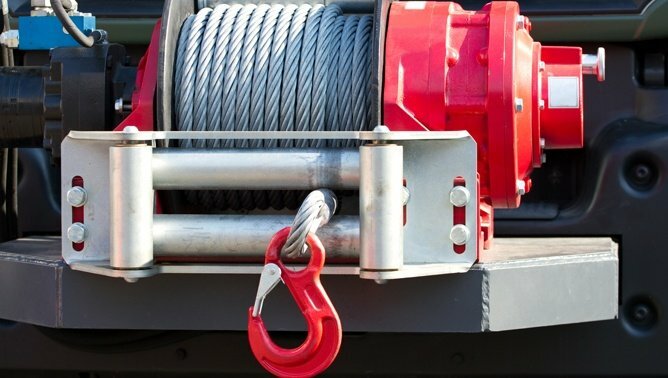 Some winches will offer you the choice between a steel cable/wire or a synthetic rope. Typically, the steel cable/wire option is cheaper since it has the possibility of rusting, kinking, or potentially even breaking. Although it’s strong and reliable, some winch owners prefer a synthetic rope even though it’s more expensive. The synthetic rope is also strong and reliable, but only if it’s properly cared for so it does require more maintenance than a steel cable/wire. The material can also suffer from abrasion and doesn’t like heat. The good news is that caring for a synthetic rope typically entails a bucket of water and a quick rinse and wipe down of the rope after it has been used. We’ve detailed the main features and specifications to look for when shopping for a winch, but there are a few other things to take into consideration when shopping for and using one. For starters, most winches will run off your car’s battery, which means it needs a certain amount of power to operate well. That means you’ll want to make sure your vehicle’s battery isn’t old and weak and that it can handle the load a winch uses. Although your alternator isn’t as important, you’ll want to make sure it can at least keep up with recharging your battery as it drains from winch use. Knowing that, you’ll also want to make sure connections to your vehicle’s battery are solid, meaning both the battery’s terminals are clean and not corroded. A bad connection could mean power loss for your winch, which will make it less effective. For the most part, the saying “bigger is better” applies to winches. You’ll want to avoid a situation where you wish you had a bigger or more capable winch. Along with offering more power, bigger winches are less likely to overheat and stall, as well as needing less time to cool down after use. Determine what you plan on needing a winch for, and choose the product accordingly. Not everyone needs maximum pulling power, but you’ll never know when it can come in handy.